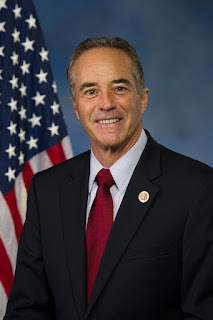 WASHINGTON, D.C. -- Congressman Chris Collins (NY-27) today introduced legislation that prevents states from diverting fees collected from consumers on their phone bills, which are meant to be used to improve 9-1-1 emergency communications systems. The Federal Communications Commission (FCC) has found that New York diverts at least 41% of 9-1-1 fees that are collected for other non-public safety related purposes. Congresswoman Anna Eshoo (CA-18) and Congressman Leonard Lance (NJ-07), Vice Chair of the Communications and Technology Subcommittee, co-authored the bill and have also seen 9-1-1 fee diversion in their home states. "It is completely unacceptable that we have seen states diverting fees meant to make important and necessary improvements to emergency response systems," said Collins. "Diverting these important fees puts lives in danger, especially in rural areas. I thank Congresswoman Eshoo and Congressman Lance for their support of this legislation and their commitment to making sure all communities across the nation can achieve the highest level of safety." "Our 9-1-1 call centers are the first point of contact for Americans in emergency situations, but many of these call centers rely on technology that's been in place since the time of the first 9-1-1 call 50 years ago," said Eshoo. "9-1-1 fees collected by states should only be used to upgrade our 9-1-1 infrastructure, not diverted to the general coffers of state governments." "My constituents need to know that in an emergency the 9-1-1 call is going to go through," said Lance. "Lawmakers in Trenton raided the fund set aside to improve the 9-1-1 system and left the account penniless – leaving public safety threatened and taxpayers on the hook. Members of the Communications and Technology Subcommittee are seeking to end this practice. The 911 Fee Integrity Act will empower the Federal Communications Commission to crack down on state governments that divert these funds and shortchange much needed upgrades to bring the critical 9-1-1 system into the 21st Century. And instead of further taxing New Jerseyans, Trenton should first stop diverting the existing fees from their intended use." Collins' bill directs the FCC, in consultation with public safety organizations, and state, local and tribal governments, to determine the appropriate use of funds collected from consumers. Currently, states are able to set their own definition of what is a covered cost for 9-1-1 fees, which has allowed them to divert fees. In April, Collins toured the Niagara County 9-1-1 call center with FCC Commissioner Mike O'Rielly where they called on the state of New York to stop diverting fees. Governor Cuomo has not stopped diverting fees, leading Collins to introduce the 911 Fee Integrity Act.